The gals wearing there Hotrodhotline T-Shirts. The 2007 Lipstick Run had 5 gals, Marlene Dawson, Shirley Holm, Barb Balanyk, Kathy Milne and myself, Liz Kitzul. 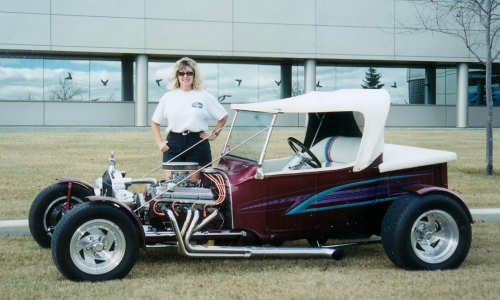 I’m took my 23 Ford T-Bucket, Kathy drove her 38 Chevy 4 door Sedan and of course Barb drove her 34 Ford Pick-up Truck. Barb, Kathy and I have been the core of the Lipstick Run since we started in 1995 and have each taken our own vehicle each and every year. Each year we hit a different car show - there are so many and all so excellent - it’s so hard to choose. So many shows – so little time. 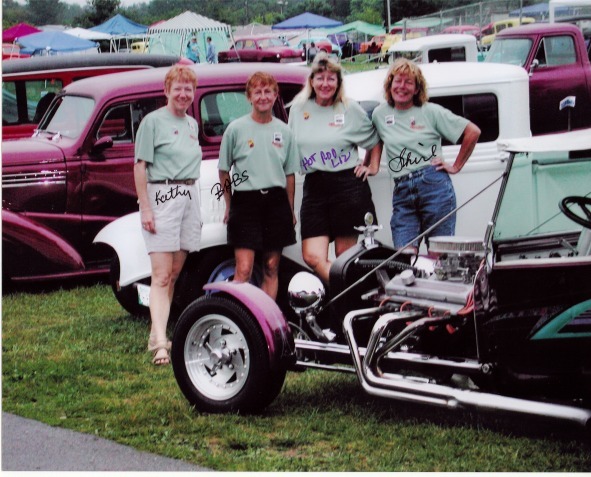 Each and every year one or more gals join up with us and we all have an excellent time, visiting friends, going on shop tours, garage crawls and to car shows and rod runs. Our 2007 Lipstick Run – destination was Nashville, TN. 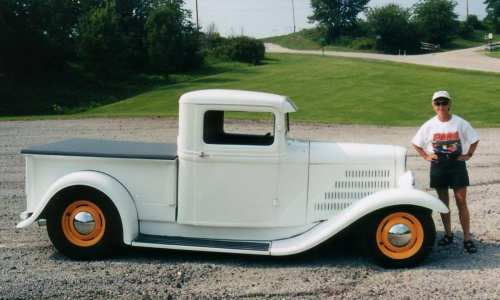 Our anticipated schedule would see us at the Back to the 50’s; touring Roger’s Rod & Customs in the twin cities; Duffy’s Car Collectibles in Cedar Rapids, Chassis Engineering in West Branch, Iowa and staying at Sheryl and Randy Sells home in Muscatine, Iowa. Next day to Yogi’s in Calamus, Iowa, then to St. Louis, MO to stay with automotive artist and rod builder Mike Keehn in Kirkwood, MO. From there we arrive in Nashville, Tn for the 2nd Annual Goodguys show. We have our own tour guide/Southern gentleman, Joe Holmes from Arlington, TN., coming to Nashville to meet with us and show us the city highlights. 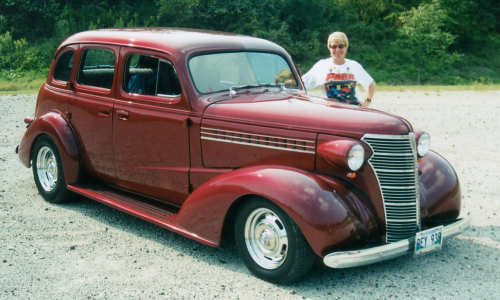 Women of Streetrodding….If this interests you….and want more information on how you can be a part of the the Lipstick Run for 2008 write or E-Mail Liz Kitzul .